You know when you get to a gig and let out an audible sigh because there’s a support act? You’ve gone because you want to see the big name that’s headlining the evening, and you’re disappointed to discover that you have to sit through half-an-hour of someone that you may or may not have heard of before you get to hear your heroes play? And you know that time when the support act is REALLY, REALLY GOOD and you can’t wait to hear more? 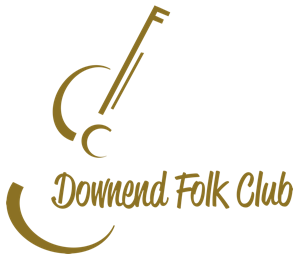 In February 2015, Maz O'Connor brought her beautiful show to Downend Folk Club. The opening act that evening was THE BLACK FEATHERS, a duo from just up the road in Gloucestershire. The Black Feathers were REALLY, REALLY GOOD! The Black Feathers, made up of Ray Hughes and Sian Chandler, first became aware of the magic between them while collaborating on several musical projects, becoming The Black Feathers and life partners in 2012. Americana, folk, and acoustic indie-rock sensibilities coexist comfortably in their musical world, with Hughes’ guitar work buoying the kind of harmonies often only heard in family bands. 2016 was an incredible year for the The Black Feathers. Their debut album was met with critical acclaim and broke into the Top 10 in the iTunes Country chart and the Official UK Americana Chart. Support on the evening will come from singer-songwriter SASKIA GRIFFITHS-MOORE, who tours the British folk and acoustic scene all year round and has a second album planned for release later this year. Tickets for the event, which takes place at Frenchay Village Hall on Friday 21st April 2017, are available from MELANIE'S KITCHEN or online HERE. The club anticipates a sell-out, so do book quickly! There will be a full bar, stocking Severn Cider, soft drinks, wine, hot drinks and locally-brewed real ale from Hambrook-based GREAT WESTERN BREWING CO., and locally-made NAUGHTY BROWNIES. There will also be a raffle, featuring some great prizes including CDs, beer, chocolates and more. You are encouraged to bring your own glass/mug/tankard/bucket as part of the club’s drive to be more ecologically aware.